White nationalists have staged a rally near the White House in Washington, but were far outnumbered by counter-protesters. About 20 far-right supporters attended the demonstration, which came a year after violence in Charlottesville, Virginia, that left one person dead. Hundreds of chanting opponents staged their own rally nearby, denouncing white supremacy and racism. The two sides were kept apart by a heavy police presence. About 400 people had initially been expected at the “Unite the Right 2” rally but on the day nowhere near that number took part. 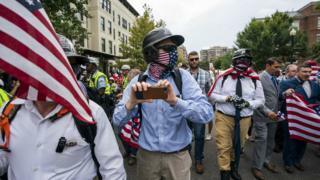 The white nationalists were escorted by police officers to Lafayette Square, in front of the White House, and were heckled along the route by a larger group of counter-protesters chanting “shame” and “get out of my city”. Tight security was in place and authorities banned all firearms from the area. After about two hours, under heavy rain, the rally ended and supporters were escorted out of the area in two police vans. A larger group of counter-protesters meanwhile gathered at Freedom Plaza, at one end of Pennsylvania Avenue that leads to the US Capitol, chanting and waving banners. As a small group of white supremacists gathered for their second “Unite the Right” rally, the rain began to fall. Much like the sodden pavements outside the White House, the follow up to last year’s rally in Charlottesville was nothing more than a damp squib. Organisers had applied for a permit for as many as 400 people – but in the end they couldn’t gather much more than 20. The counter-protesters came out in much larger numbers, a mix of locals with hand-made signs; Black Lives Matter activists, and also some Antifa – left-wing activists – dressed head to toe in black. It all passed off peacefully, to the relief of many who remember last year’s violent clashes. Police had worked hard to ensure the Unite the Right group was well away from counter-protesters. If today showed anything, it was that a message of racism was well and truly drowned out, in more ways than one. Last year’s far-right rally in Charlottesville was one of the largest gatherings of white nationalists in America in decades. The march had been organised to protest against plans to remove a statue of a general who had fought for the pro-slavery Confederacy during the US Civil War. Heather Heyer, 32, was killed after a neo-Nazi driver ploughed his car into a group of anti-racist protesters. Dozens of other people were injured in violence between the two groups.